We have two cottages, Pine Tree Cottage and Sycamore Cottage set in the town of Ballater in the Cairngorms National Park. The area is known for its Royal connections, Balmoral Castle and the Royal Lochnagar Distillery, also fishing, golfing, hill-walking, and many other castles and whisky trails. Ballater is known for its Royal Warrants, the old Royal Railway Station and its award-winning restaurants. 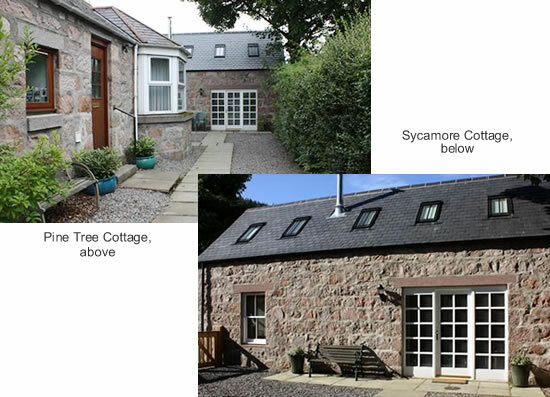 Secluded cottage 2 minutes' walk from Ballater village centre with its' many amenities & fine restaurants. Ballater is in the Cairngorms Nat. Park 8 miles from Balmoral Castle. Ideal for couples but sleeps 3. Members of ASSC. This unique and distinctive one-bedroomed cottage has been finished to a high standard and has the Disabled with Assistance Grading. Decked patio with sunny aspect overlooking shared garden and facing the beautiful Craigendarroch hill. Ideal for couples but sleeps 3. Close to centre of Ballater village centre without being right in the centre. Almost all amenties are within walking distance. Completed in 2008 to high standard, secluded & exclusive cottage in lovely village of Ballater, Royal Deeside in Cairngorms National Park. Ideal for couples. The perfect getaway! Secluded and exclusive detached cottage two minutes' walk from Ballater village centre with its many amenities. Ballater is at the edge of the Cairngorms National Park and eight miles from Balmoral Castle, the summer home of the Royal Family. The cottage is finished to high standard and is ideal for couple. Can sleep 3 - bed-settee available (surcharge applies). Minimum stay 3 nights. Both cottages are strictly non-smoking, and sorry, we are unable to take pets.